Over the last 9 years of leading eagle tours in Alaska the photo opportunities have been getting better and better but this year the opportunities were unprecedented. In the first week my first tour group were really lucky to see all kinds of weather conditions over five days from snow flurries to a blizzard and finally sunny conditions but the she second and third groups were able to enjoy something I have never seen before in all of time leading tours, 12 days of sun with light to non existent winds. The winds were what bird photographer dreams are made of, SE wind in the morning and SW wind in the afternoon, which are ideal. We had superb action in gorgeous light with perfect winds for 12 straight days, unbelievable! Eagle mid strike in late afternoon light. Sigma 120-300mm F2.8 DG OS HSM | S @ 290mm, Nikon D4, manual mode, 1/2000th s at f/5.6, ISO 640, handheld. The location for the image above is easily one of my favorites in Alaska. This is a protected tidal pool with distant spruce trees and snow covered mountain tops in the background and offshore winds in the afternoon. For most of the time this year light levels were high enough to allow ISO levels in the hundreds (not in the thousands) with plenty of shutter speed. Bank landing on the beach in warm early morning light. Sigma 50-500mm OS HSM @ 340mm, Nikon D4, manual mode, 1/2000th s at f/8.0, ISO 640, handheld. 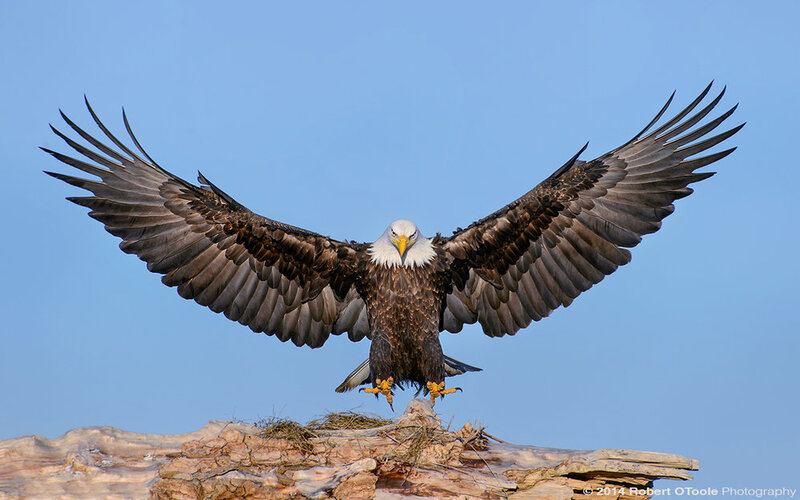 As a display of aggression some eagles when landing near a group of others with bank hard and call when landing. I try to listen for and single out these individuals whenever I hear and eagle calling. Full spread landing. Sigma 50-500mm OS HSM @ 340mm, Nikon D4, manual mode, 1/2000th s at f/8.0, ISO 640, handheld. Eagles usually prefer to land on something above ground level like this driftwood log on the beach for example so preparation and patience always pay off with images like this. One of the best things about my eagle tour, something most people can't believe, is that you don't need 500-600 or 800mm lens. My favorite images made on the tour this year were from 90mm to about 350mm on a full frame camera. My favorite lens this year by far was the Sigma 120-300mm F2.8 DG OS HSM | S. For lots of people, me included, a 300 prime lens can be great birds in flight lens but for shooting conditions on this trip a 300mm prime can definitely be too much so a 120-300 f/2.8 zoom or 70-200 with a 1.4X are just about ideal. Inverted bank before diving in perfect late afternoon light. Sigma 120-300mm F2.8 DG OS HSM | S @ 300mm, Nikon D4, manual mode, 1/4000th s at f/4.0, ISO 400, handheld. 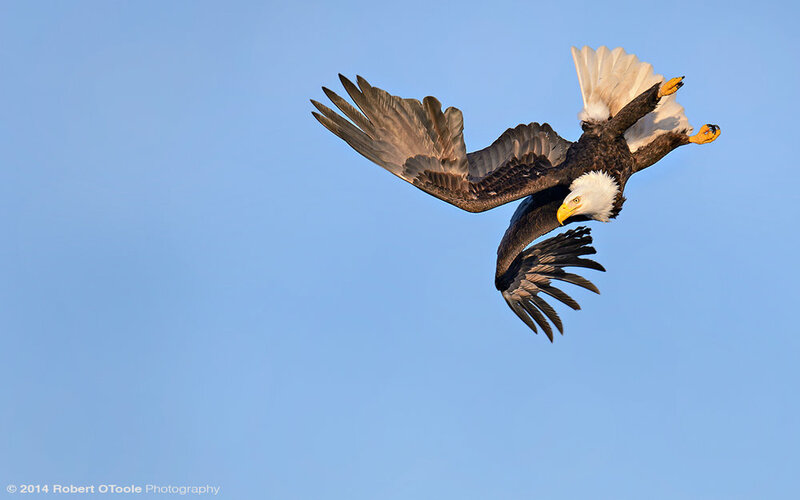 Eagles really seem to enjoy radical maneuvers in flight, like this upside down flip right before a dive. One afternoon my group was treated to an air-show when a sub-adult eagle blasted barrel roll after barrel roll miles above the tree line. It left everyone speechless. Eagle hovering with talons out in late afternoon light. Sigma 120-300mm F2.8 DG OS HSM | S @ 170mm, Nikon D4, manual mode, 1/4000th s at f/4, ISO 320, handheld. With stiff offshore winds, perfect late afternoon light and 50 eagles in the air your available memory card space seems to evaporate into the cold air. 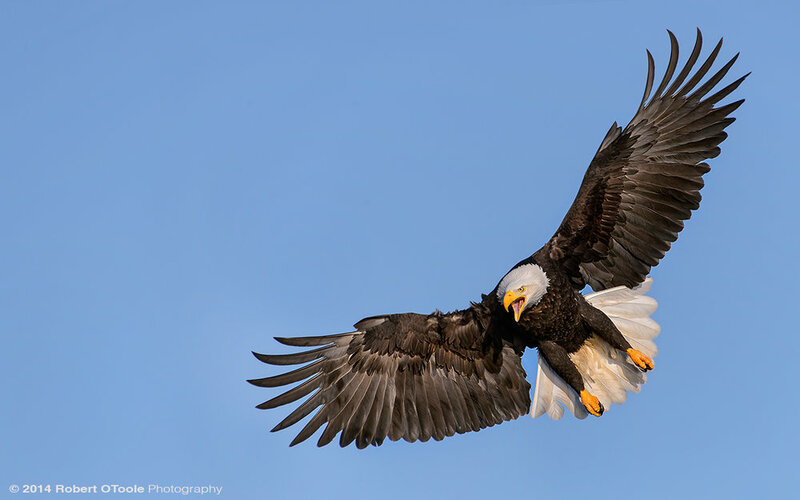 A stiff breeze will keep eagles up in the air hovering then when they want to dive they stick out their talons, flare their wings and tail out slamming on the air-brakes before they pitch forward into a dive. This is the split second of maximum stall right before the dive. This is something I will never get tired of seeing in the viewfinder! Eagle roost. Sigma 120-300mm F2.8 DG OS HSM | S @ 300mm, Nikon D4, manual mode, 1/4000th s at f/4.0, ISO 400, handheld. Soft light and lots of eagle roosting, this is exactly what you want to see when you arrive at a photography location first thing in the morning. Mar 14th - 18th, 2015, 5 days $3900. Deposit $1950. 5 photographers maximum. Mar 20th- 24th, 2015, 5 days $3900. Deposit $1950. 5 photographers maximum. Mar 26th – Mar 30, 2015, 5 days $3900. Deposit $1950. 5 photographers maximum. March 14th - 18th, 2015, 5 days $3900. Deposit $1950. 5 photographers maximum. March 20th - 24th, 2015, 5 days $3900. Deposit $1950. 5 photographers maximum. March 26th - Mar 30, 2015, 5 days $3900. Deposit $1950. 5 photographers maximum.